The best known of these Mombasa photos is the first one with the elephant tusks. 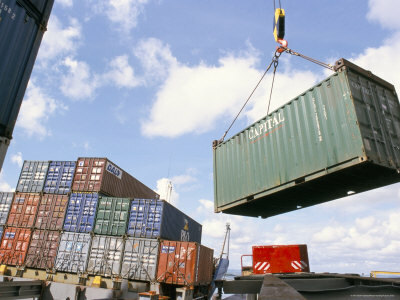 The city is the second largest of Kenya and located at the coast. About a third of the people in the Mombasa area are Muslim. Many travellers fly in through Nairobi, then do a safari and then head to Mombasa from where travel to one of the fine beach resorts at the coast. Above: This picture with the elephant tusks is the best known of the Mombasa photos here. 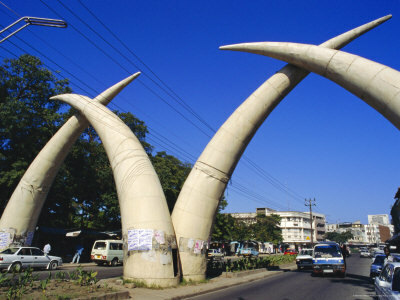 The tusks are the city’s symbol. Above: The old city. 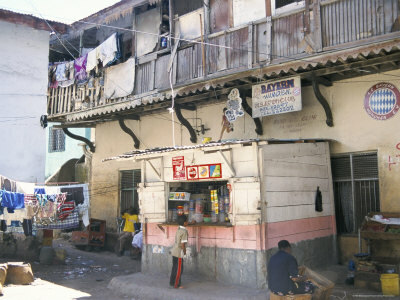 Mombasa is much older than Nairobi, which was built from 1899 on as railroad depot. 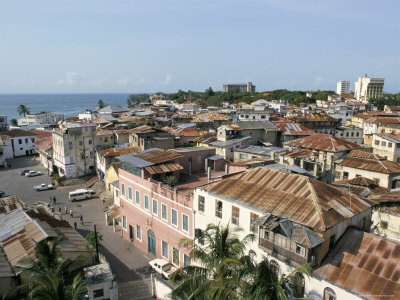 It’s unclear when Mombasa was exactly founded, but it must have been a prosperous trading city already in the 12th century. Above: Fort Jesus, built by the Portugese in 1593 by order of King Philip II of Spain, who also ruled the kingdom of Portugal at that time. It guards the old harbour of the city. 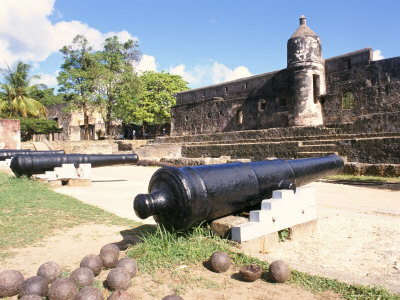 Above: The cannons of Fort Jesus. The fort has been kept well and is the main tourist attraction of the city. The guides are very knowledgeable and helpful but you are not exactly left free as to take one or not. Once you arrive, they will simply approach you and tell you they are your guide for the day – and they don’t really take a no! 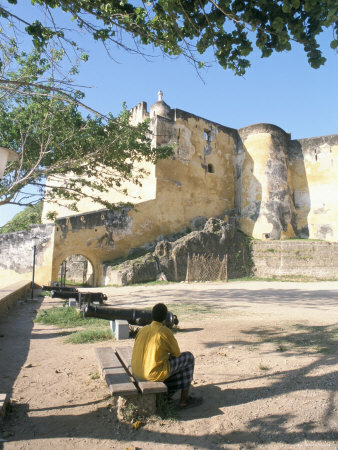 Above: A man sitting outside Fort Jesus. 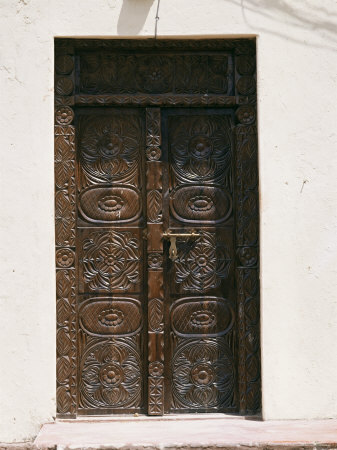 A wooden, Arab-style carved door. Muslim elements can be found all throughout the old city and other places along the coast. 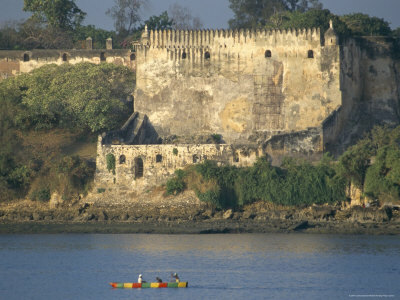 Actually the very interesting Swahili culture at the coast region is a mixture of Arab, Indian and African cultures. Above: A shop in the old town. Much of the old city centre looks like this. 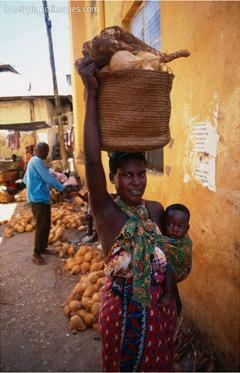 Above: A woman in Mombasa carrying a basket and her baby. Above: The view over the roofs of the old town. This picture shows that the city is located directly at the beach front. 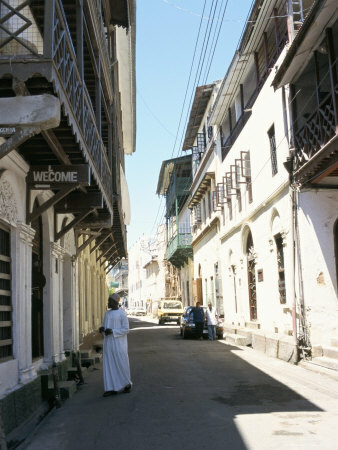 Hopefully these Mombasa photos gave you a good impression of the city.